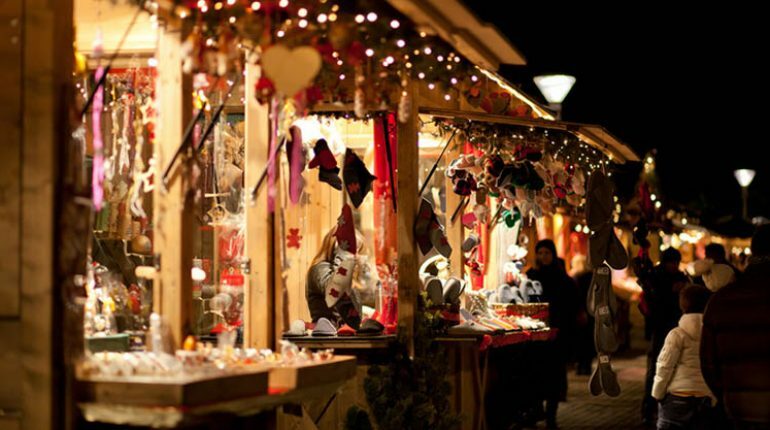 Besides the Christmas Fair which takes place every year near the harbor in Cagliari, this year the Christmas Market will take place from December 1st to January 6th, 09:30 – 22:00 h.
More than 40 booths will present their products in Piazza Yenne and in the pedestrian zone of Corso Vittorio Emanuele. Folk groups will daily cross the city playing traditional Chrsitmas tunes with the Launeddas (Sardinian flutes) . This is the perfect place if you are looking for Christmas trees, cribs, ornaments, accessories and handcrafts. You will also find the traditional fresh and dried flowers’ bouquets, poinsettias and seasonal greeting cards. Of course, Sardinian food and produces, from nougat to sebadas, cannot be missed here either. The sure place to find an original Christmas gift or souvenir to take home! From 14 to 16 December visit the Santa Claus Village (Villaggio di Babbo Natale) which will be setup in the magical atmosphere of the Corte in Giorgino (Villa Ballero), Cagliari. For three days children and adults can live the magic of the most awaited festival of the year with the company of a full-time Santa Claus. Together with the Elves-Scouts, he will welcome everybody to take a picture with him. There will be many children activities such as many booths stands, songs, gospel choirs, music, merry-go-rounds, inflatables and many more.